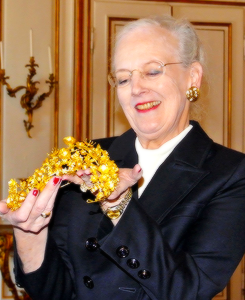 Today we're focusing on one of the newer additions to Margrethe's royal jewel box: the set of jewelry given to her by the people of Greenland to mark her Ruby Jubilee. The Naasut tiara and earrings, which make up a tidy little demi-parure, are modern pieces of jewelry that are especially suited to this innovative queen. 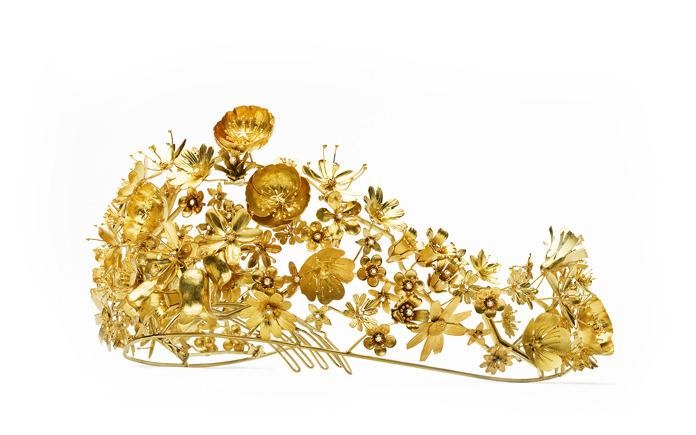 Made of bright yellow gold, the tiara is designed with several modern floral motifs. The gold that the tiara is composed of actually comes from melted-down coins, all of which were originally made with gold mined from Greenland. Appropriately, the demi-parure was Greenland’s gift to the queen on the occasion of the fortieth anniversary of her reign. It was designed by Nicolai Appel, a Greenlandic goldsmith, and was presented to Margrethe in June of 2012 by a member of Greenland’s parliament. The tiara also has a coordinating pair of earrings. While gold is the overwhelming element in the tiara’s construction, there are also diamonds and rubies scattered amid the flowers that make up the piece. The name of the tiara, Naasut, translates roughly to “flowers from Greenland.” It’s never been officially said, but I think I can detect a small link to one of Margrethe’s other tiaras in the design of this diadem: there appear to be small golden poppies in the design that look an awful lot like the poppies in the tiara designed for Margrethe by Arje Griegst. The tiara made its first official appearance at the New Year’s Levee in Denmark in 2013. 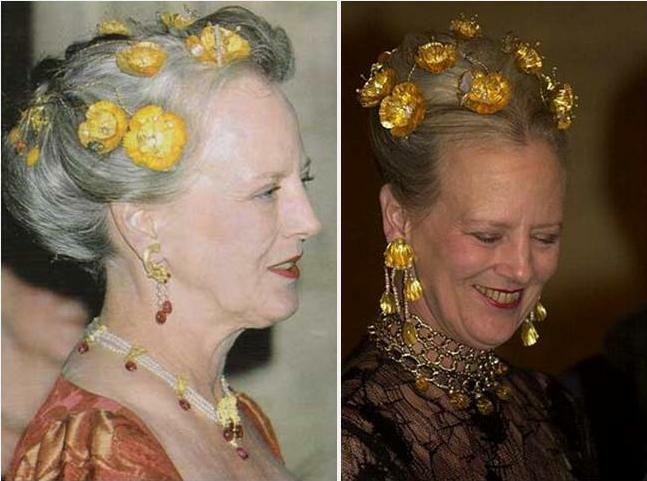 Margrethe was reportedly delighted by this new set of jewelry, and I think it’s safe to say that we’ll see her sporting this one on a fairly regular basis . 1. Queen Margrethe II at the 2013 New Year's Levee by Danny Martindale for Getty Images. 2. Queen Margrethe II at the 2013 New Year's Levee by Danny Martindale for Getty Images. 3. A version of this post originally appeared at A Tiara a Day in October 2013.